"Book In Confidence With Peter The Friendly DJ"
Peter Laver, your DJ has 21 years experience of weddings, birthday parties, children's discos and karaoke. He can also offer race night entertainment and quiz nights. Reasonably priced to cover all budgets. Required by many venues, Time 2 Disco has a current PLI policy with Mobile DJ Network in the amount of £10 million. Also required by many venues, Time 2 Disco has not provided satisfactory evidence of having current PAT records available. Why do people choose to book Time 2 Disco? Only one who sent me a quote and it was very reasonable. "Excellent DJ and would definitely recommend. Fantastic value for money. Everyone had such a great time! Thank you very much!" "Thank you for your comments, I aim to please!" "Peter was brilliant in every way. He was highly professional, very friendly, understanding of our needs and accommodating! I would highly recommend him and shall be using him again in the future. Thank you, Peter. You really made my parents 60th wedding anniversary even more special! " "Very very please with Peter, he done a brilliant job and would highly recommend him." "glad you enjoyed the party, enjoyed it myself also"
"Very happy with Time2Disco. They were very professional and accommodating. We would definitely recommend them and may well use them again in the future. " "Your music choices were great! made my job easy." "Brilliant night, such a lovely man! Made our special day perfect for us! Thank you so much. Will consider and recommend for future events." "lovely couple - I am glad you were happy with me." "Peter was great, was there early, set up and ready. No hesitation in recommending him in future. Thank you." "He was fab, so helpful and we are definitely booking for next years party too!" "Thank you for your kind feedback, I really enjoyed the evening! your song choices were excellent!" 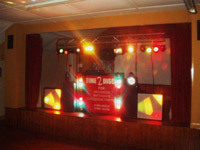 Time 2 Disco also offers a range of additional party services not directly linked to musical entertainment. You may contact Time 2 Disco directly using this form. If you are contacting Time 2 Disco about an event, it's always a good idea to include the DATE, LOCATION, EVENT TYPE, AGE GROUP and TIMINGS to speed things up!